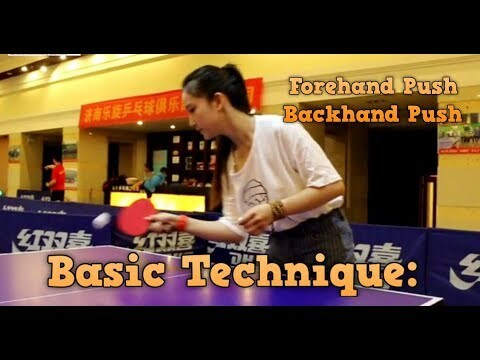 Forehand push and backhand push are one of the 10 basic techniques in table tennis. Every new player should learn and master these techniques. Today, let’s learn how to do the forehand push and backhand push techniques in table tennis. The tutorial is demonstrated by Zhao Yiyi. The push technique is the fundamental technique. The push technique is very important. It’s one of the best ways to control the ball when you don’t have the opportunity to attack. A good push can also prevent the opponent to attack first. Firstly we study the forehand push technique. To do a forehand push correctly, you need to prepare both for footwork and your stroke preparation. The arm is naturally relaxed! step your right foot forward to the table. Put the body center of gravity on the right foot. “Yin Pai”, elbow close to your body. Relax your wrist! Very important! Open your racket! Remember don’t contact when the ball is too far from your body! Hit the ball! The force direction is forward! By doing this, you will have a stable shot. Brush the ball at the bottom, around 4 o’clock. Backhand push technique is a little different. The important point is where is put your elbow. “Yin Pai”, put your elbow outside your body, but close to the body. “Cut” (push) the ball at the bottom. Use your wrist, and “accelerate” into the ball at the moment of contact. Some amateur players forget to “accelerate” into the ball, so the push has little spin. There is 2 type of push technique: Fast push, and slow push. Slow push: Easy to perform, mostly used by beginners. Fast push: Require better timing, used by pro. For slow push, you contact the ball after the highest position, position 4-4.5 timing. Slow push will generate long and heavy underspin ball. Fast push will return the ball faster, but less spin. For fast push, you contact the ball at the early timing, position 2 timing. Advantages Make opponent less time to response Higher spin and long ball. Easier to be attacked. Placement is crucial. If you don’t know the timing position (from 1 to 5), you can read the tutorial “Optimal timing in table tennis”. The timing is very important. It affects the spin and the speed of the ball. For the fast push, contact the ball earlier (like the pro). Professional players tend to push earlier to make pressure on the opponent. Slow push is easier to perform. Push the ball later can increase the spin, but slow push can be attacked easily. Amateur players tend to contact the ball late, and normally make the ball long. Use fast push to surprise your opponent! Use backhand push only when you can’t attack the ball. For the no-spin ball or topspin ball, don’t use the backhand push. But you should take initiative by doing the backhand flick, or backhand topspin. Attack all the long ball! Don’t push the long ball! Always adjust the angle of your racket depends on the amount of incoming spin. For less underspin ball, you should close more your racket. For heavy underspin ball, open more your racket’s angle. These are the basic table tennis techniques that every player can do it easily. Learn more about another fundamental technique here. For this shots, focus on the consistency, and control the placement of your push. The push is used to return the serve passively! These are another backhand and forehand technique that can help your return the serve actively. Hope you enjoy this ping pong lessons. Your coaching technique are great! You are a big help to beginners like me. Thank you very much!